Your top six finishers talk about the Main Events. 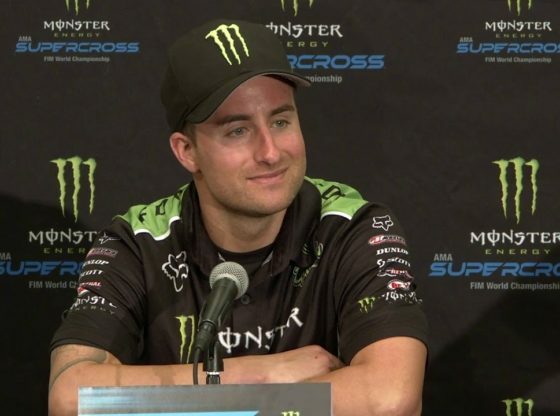 Monster Energy® AMA Supercross, an FIM World Championship, is the most competitive and highest-profile off-road motorcycle racing championship on the planet. Over 17 weeks between January through May and a million-dollar All-Star Race, Supercross attracts some of the largest and most impressive crowds inside the most recognizable and prestigious stadiums in North America to race in front of nearly one million live fans and broadcast to millions more worldwide. The track takes all the exciting obstacles of outdoor riding—jumps, turns, and bumps—amplifies them, and puts them in easy view of spectators. Founded in America and sanctioned by the American Motorcyclist Association (AMA) in 1974, Supercross is currently co-sanctioned by the Federation Internationale de Motocyclisme (FIM), the official global governing body for motorcycle racing, thus making it a formal World Championship. Monster Energy Supercross is available on TV via NBCSN and streaming on NBC Sports Gold in the US. Monster Energy Supercross is available via Supercross Video Pass outside the US. Team Australia Announced Ahead of 2019 TdN. The official Australian squad for the 2019 FIM Trial des Nations (TdN), landing in exotic Ibiza, Spain from 27-28 September, Team Australia will seek retribution after a difficult 2018, with sights set on reclaiming the International Trophy. Ross Chastain receives heavy damage to the No. 4 car after an incident in Stage 1 of the NASCAR Xfinity Series race at Bristol.